Canadian guest blogger Quinn Caroline Hannah talks about art from a blue gown perspective. This time she recounts her experience in the psych ward in the context of the exhibition Walking with our Sisters, a memorial for the many murdered and missing indigenous women in Canada. In late June of this year I arrived in Red Deer, Alberta (Canada). It was National Aboriginal Day and I was there to visit the monumental and sacred exhibition Walking with our Sisters. I had been anticipating seeing this exhibition for weeks, knowing the opportunity was finally arriving that I could. I had wanted to see it for much longer. And as I drove East on Highway 16, known as the Highway of Tears out of Prince George, BC (Canada) to see it this June, I was thinking of all the women, named, unnamed, murdered, missing. I passed Tabor Mountain, just 20 minutes into my whirlwind 1800 km road trip, thinking about 14 year old Aileah Saric-Auger, whose body was found murdered there in 2006. I had sage on my dashboard that I burned in her memory. Arriving at the Red Deer Museum I could smell the sage. I removed my shoes, out of respect, as the volunteers and elders requested, and put on a long skirt. These were traditional measures the Métis and Cree elders in Red Deer put in place to show respect for the exhibition and the women whose lives were represented therein. As I waited to enter the space I could feel the emotion swelling in me, honour, sadness, confusion, for the nearly 1200 missing and murdered Indigenous women. They are not just one of a sum of parts in the figure 1200 – they are daughters, mothers, sisters, wives, nieces, aunts, friends. These women lost their lives brutally, some have been missing for decades. Some were babies. Some grandmothers. How much I felt for these women, some of whom lost their lives at the age I am now. A profound sadness, deep in my belly. Walking with our Sisters. Moccasin "Vamps" by Dolly Assinewe, Photo exhibition website. As I entered the space a beautiful elder smiled warmly. She held eagle feathers and an abalone shell – both traditionally used to smudge in ceremonial practice – as she wafted the sage over us. With this simple gesture I felt cleansed, nurtured, prepared to embrace the project before me. Overcome with its power, I allowed the tears to cascade. I was held ceremoniously in the warm embrace of a tradition beyond my understanding. The endurance of it washing away fear, cleansing me, freeing me, readying me for the journey to honour all of our sisters, all of our women. I approached a second elder, gentle and kind. “This is ceremonial tobacco” she explained. “Hold it in your left hand to your heart. It will carry your prayers for these women, our sisters.” I nodded and began my journey through the exhibition. 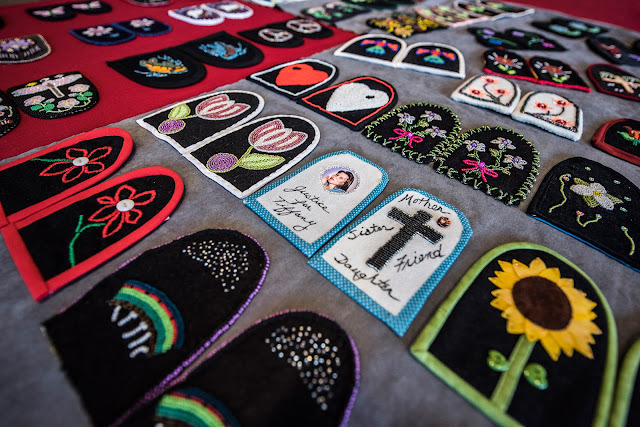 The exhibition Walking with Our Sisters organized by artist Christi Belcourt consists of nearly 1200 pairs of vamps, or uppers – the top part of the moccasin – beaded and decorated by volunteers namely from Canada but also from across the world, to represent each of the murdered and missing Indigenous women. Some vamps are traditional, others not. 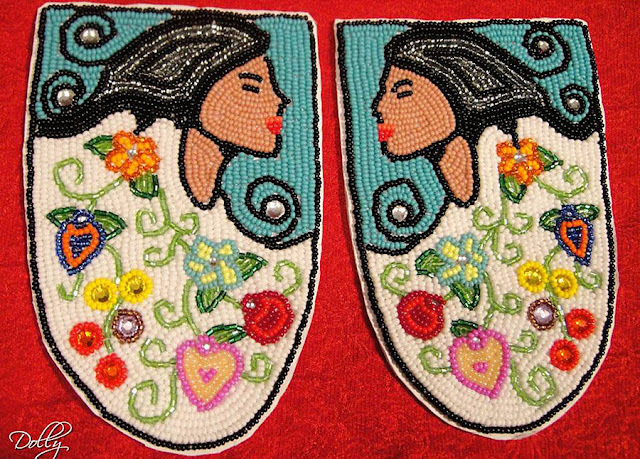 Many are beaded, others painted. They are all unique, beautiful and intricately crafted. The time and craftsmanship that goes into creating a pair is evident when looking at each individual set. The vamps are laid out on red fabric running the perimeter of the room and directing our journey as we walked side by side each of the women, metaphorically, who are missing or who have lost their lives. Traditional and ceremonial songs played quietly in the background. I felt much sadness, for the families of these women who still have no answers. Our government stands idly by. Our voices continue to rise in opposition, in protest, calling for a national inquiry. The Idle No More movement was born from this kind of oppression. And my voice is one among these voices. A week later, I was in the hospital, in a blue gown, waiting to go “upstairs” to the Psych Ward. Waiting through Limbo one, in the ER, Limbo two, in Family Medicine and finally arriving at Limbo three where I could shed my blue gown skin and start to absorb experiences, hear voices anew. In the Psych Ward I met several First Nations women as well as many other people: women and men who lived on the streets, who come from upper or middle class homes. Yet I was still in that space among the minority. We all have our own trauma. We all have our own demons. I was lucky my demons never led me to drugs or the streets. I was a lucky girl because of my privileged situation in Canadian society. I still fought with my demons. I arrived in the psych ward in July 2015 after downing a handful of pills. I told them I wanted to sleep. I wanted to check out for awhile. My diagnosis upon arrival: major depression. I saw a psychologist, three psychiatrists and countless social workers and mental health clinicians. I was given two antidepressants, a mood stabilizer and three anti psychotics to take. I was doped up, sad and despondent. I stayed in my room, I had a room with a view, like Virginia Woolf. I stared out the window, I read, I slept. I had already cried all the tears I had in ER. Now I just stared, doped up on meds. Diagnosis in the psych ward: bipolar disorder, major depression and borderline personality disorder. But diagnoses and what brought you to the ward are off limits. No one asks about these things, as if it’s an unspoken rule. I saw Aly when I stepped off the elevator, accompanied by my caring mother-like counselor, when I arrived on the third floor, the Acute Adult Psychiatry Ward. She gave me a death stare that would stop anyone in their shoes and I cowered behind Nadia as we made our way to the nurses station. Pregnant, tattooed, arms covered in scars, sitting by the phone, I knew she owned the phone at that moment. She was wearing Psych Ward clothes – hospital pajamas, recycled t-shirt and hospital footies – what Marya Hornbacher in her book Madness called the little slippers they provide you with in the hospital, if you don’t have your own shoes, or they won’t allow you to wear your own shoes. The first time I went out for a FAB (Fresh Air Break), Aly was on the elevator nicking out, as she would put it. Sometimes they wouldn’t allow her cigarettes, not because she was pregnant but because she wasn’t trusted to go outside on her own or even with a nurse accompanying her. That day she ran out of the elevator and met her boyfriend. The next day she was gone. Later, I found out that she had been smuggling drugs into her room and doing them and was put in isolation. Veronica arrived a week after me. She was cheerful, kept to herself watching movies to get through the day. She watched movies, and used the treadmill in her hospital footies, pajamas and recycled t-shirt until they allowed her to have her clothes back. Like Aly, she was brought in under the Mental Health Act: she was certified. I was not. I was there voluntarily. After Veronica got her clothes back we became friends. We bonded instantly like sisters. We went out for FAB’s each quarter to the hour and called it the FABulous break, and the fabulous basket was where we could find our cigarettes. And, Alice. I met her a couple weeks after I arrived. She was shy and tiny. So thin. She too was wearing hospital clothing and I later found out why I hadn’t seen her when she arrived: she had been in isolation, coming down from psychosis. Soon Alice emerged from isolation a bit bedraggled (do they have showers in there? I don’t know.) She had been on the street for six months, her own mother turning her away. She was starving, homeless, living in different shelters, could never shower, never knew if her things were safe, and being harassed by the police for no reason. While Alice, Veronica and I became close friends, Aly never opened up. She didn’t have girlfriends, or friends really on the ward. She was tough and mean. But soon she started to be nicer. And I found out when she was a child her mother was imprisoned for murder, and died in jail. She must have ended up on the street at that point. Or living in bad circumstances. This is the story you hear about many First Nations families, fathers and mothers. And their children carry on this tradition. It is all they have known. In Canada, it is now a time of reconciliation. The government has officially apologized for the residential school system – a sector of catholic schools that young First Nations children were forced into: taken away from their families, forced to speak English, forget their culture, their languages, their ways of living, their traditions and ceremonies. All kinds of abuse happened in these schools that continued for decades. The Truth and Reconciliation Commission of Canada ruled that the Residential School System was in fact a form of cultural genocide that the Canadian government perpetrated on the First Nations people. A hard truth to hear, a truth that needs to be spoken. This legacy is what has haunted First Nations for generations, and continues to haunt them now. Resurfacing from a legacy of abuse of power, violence, and colonialism has silenced First Nations. Not just women, but women are particularly susceptible to such abuses, as we’ve seen through history with the suffragettes and the raising of the feminist movement. Walking with our Sisters provides a sensitive forum for First Nations women who have been murdered or who are missing to be heard. Through this project they are no longer silenced. This is what I heard: “My life is important, I am important. We are important.” It wasn’t until arriving in the Psych Ward and listening to Aly, Alice and Veronica share their stories, in a place where we could all share openly and know our truth was being respected that I truly understood the power of their voices, and of all Indigenous women’s voices. PS: Since writing this we have had an election, and our previous government lost their majority meaning we have a new Prime Minister of a different party. Justin Trudeau is going to start a national inquiry into the epidemic of murdered and missing Indigenous women, when is not yet clear. However, this is a huge deal for First Nations, a huge victory already.